We have a few things to report in case you missed it on Facebook, Twitter, Tumblr, Instagram ...etc and elsewhere! Welcome to Issue 4! 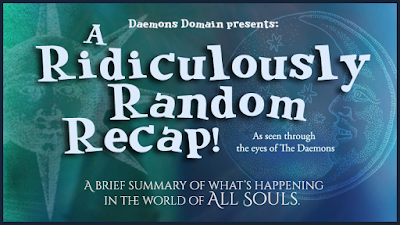 This is sort of a pre-game recap/run-up to AllSoulsCon! We are covering from the 8th of August, 2015 through today, with a look ahead of what is going on in the All Souls Universe from today and beyond! Deborah Harkness events will be listed on the bottom of this post. Let's do this! If you plan to buy a ticket, you can do so until the morning of September 12th! See what's planned: ASC schedule. Market Hall Foods—10% off throughout the store with special promo code (they sell Diana's favorite tea)! FetchGoodyAlsop—is providing the convention badge, the tabletop figurines, and Corra. 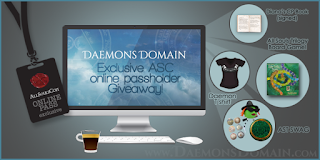 Daemons Domain—we are opening an AllSoulsCon section (early! The forum isn't even officially open yet!) in the All Souls Gathering online forum. You virtual pass holders won't be there in person, but you are in for some special treats! In your virtual goody bag will be great items from The All Souls Podcast, A Feast for All Souls and FetchGoodyAlsop! Also, you are going to be the only ones eligible for some really great online contests, including ours! All of this will be available with the purchase of your virtual pass. ASTDG is in the AllSoulsCon spirit as well! They have been giving out free virtual passes to their members along with other AST prizes as part of their 'Creature Challenge'! Link is above; it will take you to their FB discussion group. Online pass-holders! Don't forget to ENTER! 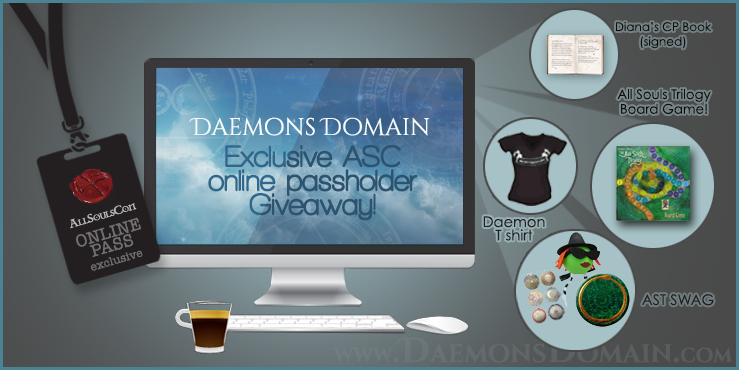 We are currently completing last minute homework for our part in AllSoulsCon (more on that in a future post), and we are holding an exclusive giveaway for virtual pass holders...it's a true fan package! At Armitage4Clairmont, we continue to wait, watch, and urge fans who believe in the mission to please write the BBC! A big belated "congratulations" goes out to to Emma and Stacy for winning Diana's Birthday contest (a contest we had with partners AllSoulsCon and The All Souls Podcast), and The Downloadable Giveaway! We hope you both enjoy your prizes; Stacy, we'll see you at the Con! 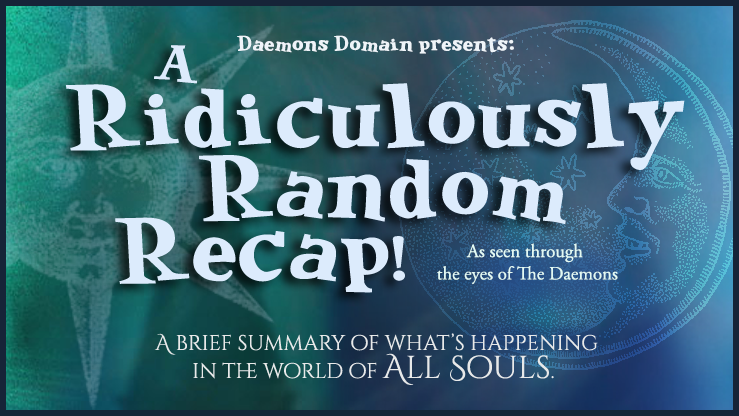 Do you know of anything going on in the fandom that you'd like to see included in these recaps? Please contact us! If you are the owner of a website, group, or page, and you'd like to relay something to the All Souls Community, we are talking to you! We love to hear about new events, story related items, or articles as long as it has to do with the All Souls Trilogy! Do you like our regular features/posts? Subscribe to Daemons Domain!